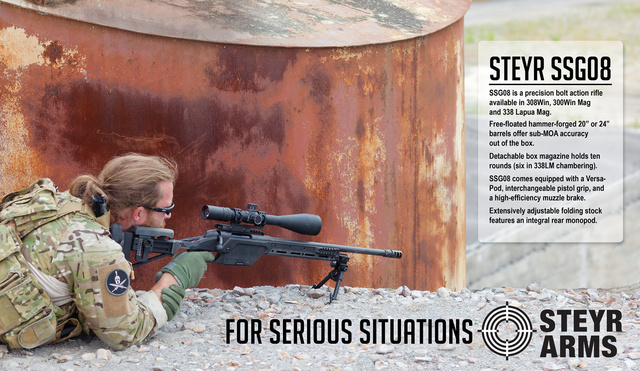 I will be posting a practical comparison between SSG08 and SSG69 later this summer. One is adjustable but the other has the charm of simplicity. Shown here with the old version of 3.5-15×56 Nightforce scope. This entry was posted in rifle, self-defense, weapon and tagged 308Win, bolt aciton, nightforce, Steyr. Bookmark the permalink. I saw one of your photos in American Rifleman again this month, in an advert for the Kel-Tec P3AT. Well done, sir! These Steyrs look really interesting – I am going to check the price point. Thank you the picture of the lovely rifle. When you do your write-up would it be possible for you to address any differences, such as may exist, between the .308 and .300 Win Mag action length and magazine form factor/capacities of the ’08?